Hellma Analytics produces a wide range of cuvettes for use in spectroscopy and cytometry. Thanks to their stability, maximum precision and reliability when used for absorbance, fluorescence and Raman measurements, Hellma cuvettes, flow-through cuvettes and probes work exceptionally well in a wide range of areas in the lab. Are you looking for a specific cuvette? 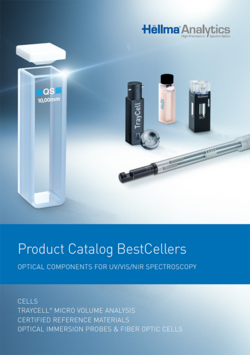 Are you looking for a probe or measuring cell? In our DAkkS calibration laboratory, which is accredited to DIN EN ISO 17025, we manufacture certified reference materials based on the regulatory issued by NIST (National Institute of Standards and Technology), ASTM (American Society for Testing and Materials) and Pharmacopeias (Ph. Eur., USP). As a result, our certified UV / Vis reference materials meet international standards and create the basis for reliable measurements for our customers. Please select your title... Dr. Prof. Prof. Dr. I would like to receive the Hellma Analytics Newsletter, which once a month provides exciting information about Hellma applications, products, news and promotions. I have read the data protection clause and agree to the processing of my personal data described therein. Note: Your data will of course be treated confidentially and will not be shared with third parties. You can revoke your consent at any time by clicking on the end of each e-mail.